Week 13 of the 2013 season opens with a Thanksgiving tripleheader. 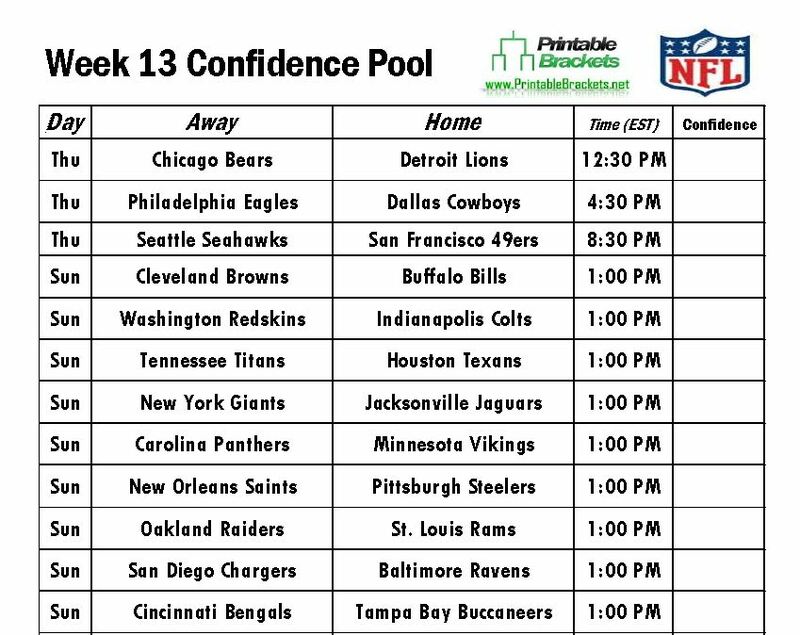 There’s only a month left in the regular season and each game on the NFL Confidence Pool Week 14 sheet is becoming more important. You can download and print off the NFL Confidence Pool Week 13 sheet. You can also operate a standard office pool with your co-workers, friends or family with a traditional Week 13 Pick Em sheet. Both of these sheets are available at no charge from PrintableBrackets.net. Family, friends, food and football have become staples of Thanksgiving in the United States, and no team has played more on the Thursday holiday than the Detroit Lions. In 2014, Detroit will be playing on Thanksgiving Day for the 75th time in franchise history. The Lions will lock horns with Jay Cutler and the Chicago Bears. Meanwhile, the Cowboys also have a storied Thanksgiving history, as they have been playing on “Turkey Day” since 1966. On a snowy Thanksgiving Day in 1993, the Cowboys famously suffered a 16-14 loss to the Miami Dolphins. Dallas will welcome the rival Philadelphia Eagles to town this season. The defending Super Bowl champions will be in the spotlight in the Thanksgiving nightcap, as the Seahawks will renew their bitter rivalry with the San Francisco 49ers at Levi’s Stadium. Meanwhile, Sunday’s action on the NFL Confidence Pool Week 13 sheet is headlined by a meeting between the New England Patriots and Green Bay Packers. In other action, the New Orleans Saints will hook up with the Pittsburgh Steelers, while the San Diego Chargers will clash with the Baltimore Ravens.